Appel, G., López-Baucells, A., Magnusson, W.E. & Bobrowiec, P.E.D. (2017) Aerial insectivorous bat activity in relation to moonlight intensity. 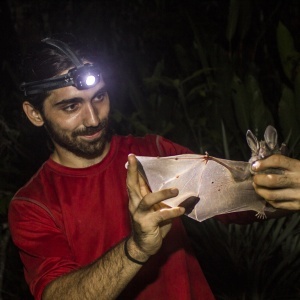 It is commonly assumed that aerial insectivorous bats in the tropics respond to moonlight intensity by decreasing their foraging activity during bright nights due either to an increase in predation risk, or to a reduction in insect availability. The effect of moonlight on bat activity can be measured both between nights and within a single night. However, few studies have simultaneously used both approaches, and most authors generally compare bat activity with lunar phases. Our main aim was to evaluate how moonlight influences aerial insectivorous bat activity at different time scales: between nights and within the same night. Activity of five bat species was measured using autonomous ultrasound recording stations and moonlight intensity percentages retrieved from the Moontool program nightly throughout a 53-day sampling period. Only one species (Myotis riparius) responded negatively to moonlight, while two species (Pteronotus parnellii and Saccopteryx leptura) increased their foraging activity in moonlight. For Cormura brevirostris and S. bilineata, moonlight intensity did not affect activity level. Bat activity was greater for all species at the beginning of the night, independent of the presence of the moon, indicating that foraging just after the sunset is adaptive. Thus, bat response to the effect of moonlight intensity is more apparent between nights than within a single night and may depend on species-specific traits, such as flight speed, flexibility in habitat use and body size.